1523, London. The Abrizzi family is visiting the court of King Henry VIII as envoys from Florence when the head of the family, Lord Francesco, is shot in the head in a marketplace by an arquebus – a new-fangled hand-cannon. But with no witnesses and no trace of the weapon, the murder seems impossible. Meanwhile, Benjamin Daunbey, nephew to Cardinal Wolsey, is summoned to court, collecting an old court physician on the way. But the physician is found dead, floating in a bath of blood, a victim of an apparent suicide. Ah, comfort reading. If ever I’m having trouble starting a book, solution one is always Dr Doherty. Heaven help me when I finally make it through his back catalogue – I’ll probably start again from the beginning. And, at a particularly slow patch in my reading – this is only my fourth book this month – it’s always the ideal thing to kickstart matters. This is the fourth book in the Journals of Roger Shallot, the over-exagerrating narrator, and the writing style, in the first person, makes this one of my favourite of Doherty’s series. The first two books in the series were outstanding, but I found the plot of the third book a little lacking due to a pretty obvious killer. This one is also a little lacking in one tiny aspect, but not for the mystery. There’s a big, encompassing plot going on here which impressively gets tied together by the end of the book. A number of unrelated happenings all mesh together nicely by the end of the book, with plenty of incident to keep the story moving forward at all times. The problem is the explanation of the vanishing gun-thingy is pretty weak, but I suppose you can excuse the… explanation due to people’s unfamiliarity with the technology. However, this is a tiny part of the plot and so can easily be overlooked. All in all, it’s a fine entry in the series. 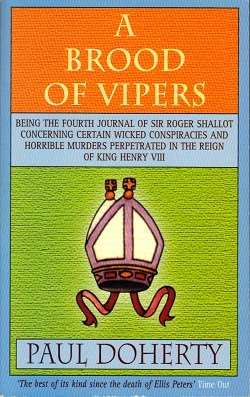 Perhaps not as strong as The White Rose Murders or The Poisoned Chalice, but well worth a look.